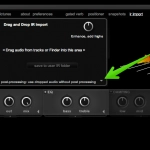 In my last post I wrote about Audio Ease’s Altiverb 7, an impressive convolution reverb plug-in. 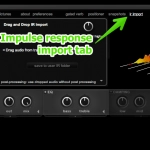 I was excited to learn that Altiverb 7 had the ability to add your own impulse responses (IR). IRs, of course, are templates used to place reverb found on location upon other clips and field recordings. 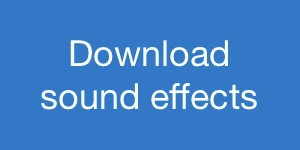 Audio Ease helpfully includes a tutorial for how to create your own impulse responses. The truth is, though, it’s cumbersome to do. The actual process isn’t hard. 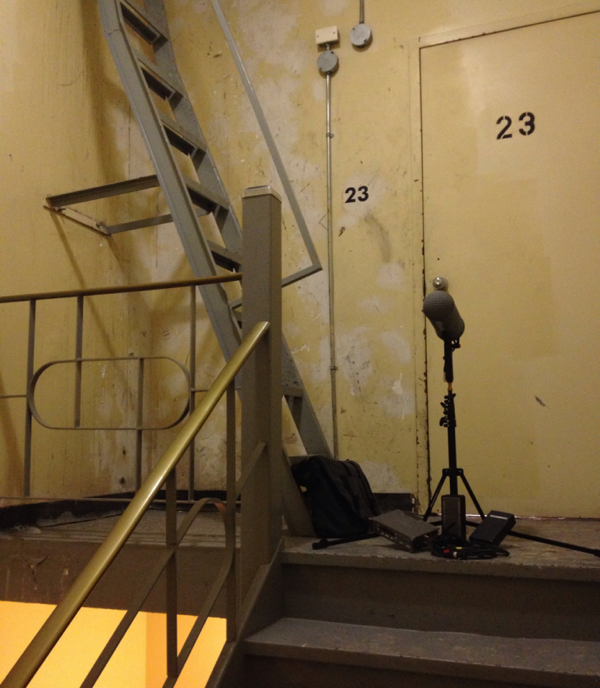 However, we’re usually too busy tending to other field recording tasks to pause and capture an IR. Just the same, I was determined to slide IR recording seamlessly into my workflow. This week I created a handful of them. I used a method that takes much of the agony from the process. I’ll share that method today, as well as the IRs I recorded for you to use yourself. Why bother with the hassle of capturing IRs? Well, recording your own IRs means you can sample and apply the reverb found in places you visit to any clip in your sound library. That means you can place theatre dialogue in the precise church location where a film scene was shot. 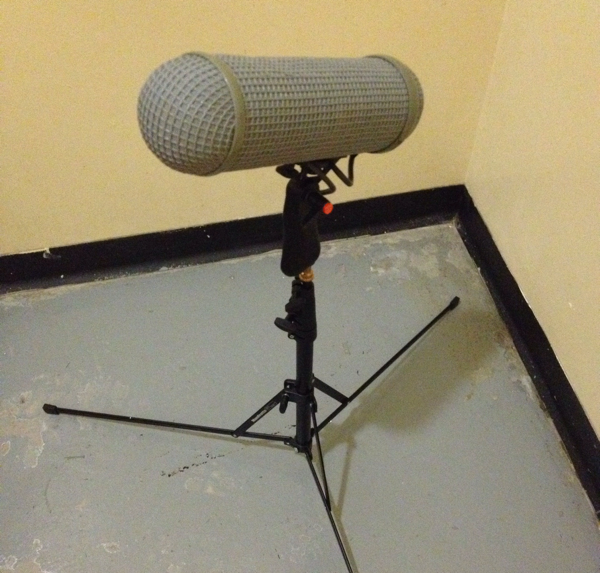 Sound effects can be submerged into the reverb of stadiums or monuments. Do you have a gun battle in the streets of a city, like the classic shootout in Heat? It’s not a problem. Simply fetch an IR from the city and apply it to your gunshot tracks. Want to use that weird slapback you found in an alley for sound design? Capture the IR there and lay it over your sci-fi sound fx. Need to make a babbling television set seem like it is next door? 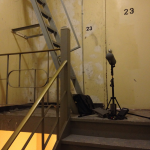 Record an IR played through a wall and run your sound clips through Altiverb. It’s done. A playback device for a reference song or sample. AC power (for the monitor). Additional time to set up gear and record the IR. You’re used to hauling around your regular kit, of course. Setting up a decent monitor is a bit of a hassle, however. I’ve mentioned that I prefer a minimalist recording kit. 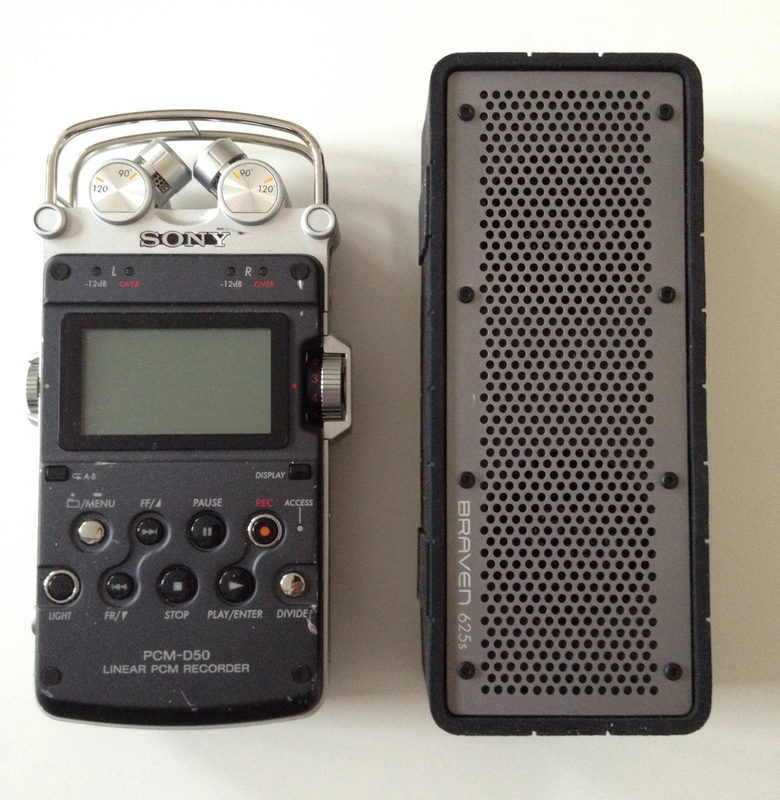 That helps me move to, respond to, and capture field recordings quickly. I didn’t want to be weighed down by a 25-pound monitor and nests of cabling. Ideally, I wanted something I could stash in my kit, and pull out when I discovered a cool space for an impulse response. For a playback device I decided to use my iPhone. That would store a song that I could play for reference. I’d be carrying that anyway. I chose not to use a clapperboard. They’re usually the size of a clipboard, and I definitely didn’t want to be lugging that around. Instead, I decided to use the sweep audio files provided by Audio Ease. Those would live on my iPhone, too. I created a playlist for those, alongside the reference song. What about a monitor? Capturing the best IRs demands decent audio. At one extreme, I could use a self-powered studio monitor. That was out of the question. While the sound would be excellent, a studio monitor would be too heavy and awkward. Surely there was something better. Respectable frequency response spread. Studio monitors would provide a full 20 Hz – 20 kHz spectrum. That’s not always possible with portable units, but I wanted to get as close as I could. Hi-fi quality. I mean that in terms of manufacture, as well as sonic quality and transparency. Also, the unit needed to play the sweep loudly. Lo-fi kits don’t have much juice. Small size. It had to fit with the rest of my kit. Robust construction. I’m fairly rough on my gear. The monitor needed to be able to take a beating. Connectivity. I wanted Bluetooth or wireless connectivity. That meant that my iPhone could play back through the speaker without any cabling at all. Ports for cabling were needed for backup, of course, if fidelity became an issue. In the end, I decided upon Braven’s 625s. That had all everything I needed. It had a reputation for excellent high-fidelity sound, and was built for abuse. 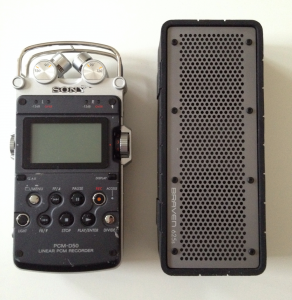 And the best thing: it isn’t much larger than a portable recorder. Update: Since I wrote this post, I returned the Braven because the sound quality wasn’t that great. 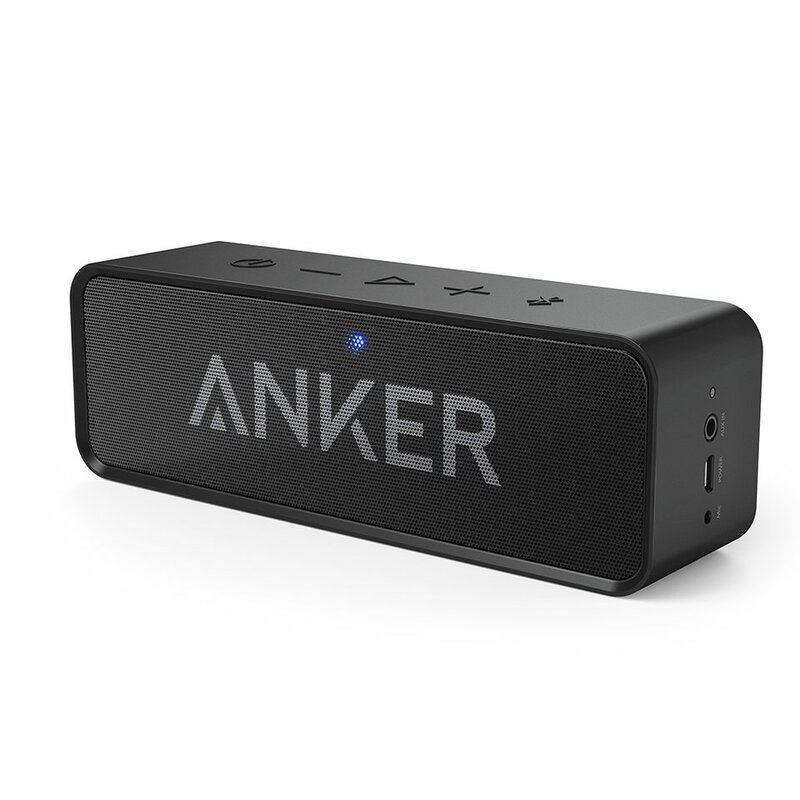 I have since upgraded to an Anker SoundCore ($34.95), which is much better. I won’t blame you for being skeptical. I was, at first, too. However, the Braven was built to produce sterling, high-fidelity sound, despite its size, and it had a price to match. Could something so small produce sufficient audio? We will see. I loaded up my iPhone with the IR sweeps. I chose Mozart’s Serenade #10 in B Flat as the reference track. Why? Well, classical music is often recorded with extreme attention to recording and mastering quality. Orchestral music also provides a good spread of frequencies without the oppressive compression of contemporary tracks. Be careful, though: many classical tracks are captured in churches and halls with their own reverb. That may complicate comparing reverb and IRs. Intimate recordings are preferred. 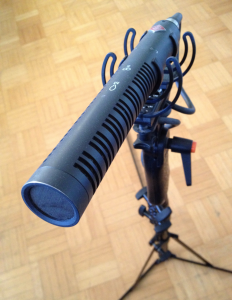 I decided to use my Neumann RSM 191-i as the microphone. It’s exceptionally clear and accurate. That would record the IR sweep to a Sound Devices 722. 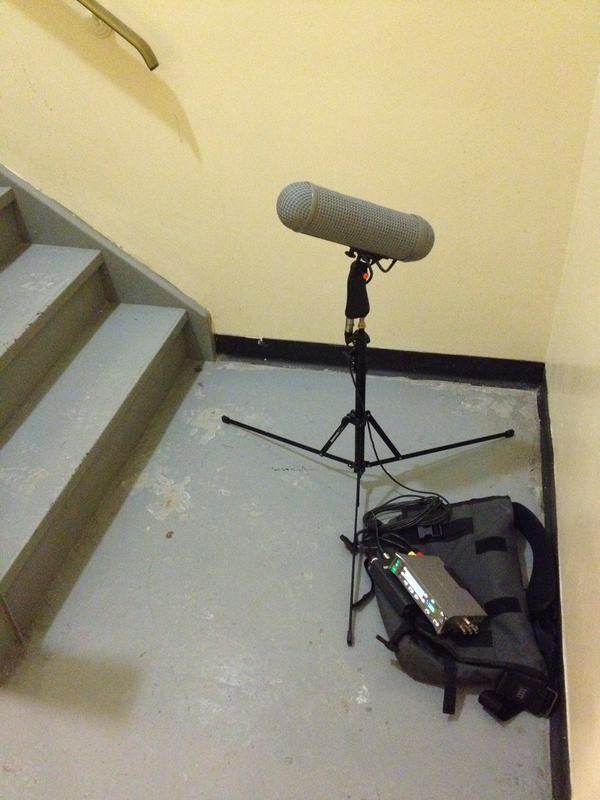 With that, I decided to capture a typical evocative impulse response: an echoey stairwell in a 23-floor high-rise. Set up your gear. Pair the iPhone with the Braven 625s for playback (or whatever playback device and speaker you’ve chosen). Power up your recording kit. 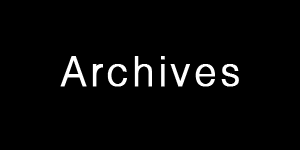 Playback reference track. Play the song. Find an ideal location. Listen to the reference track through your recorder. Don’t listen to the music, per se. Listen to the reverb. Adjust the microphone’s position to capture the best reflections. Begin recording the reference track. Begin recording and restart the song. This is done for reference purposes. This way, your recorder will capture the actual, accurate song as heard in the original environment. This will be used to compare with processed versions, later. Playback the sweep. Play the sweep file, clap the clapperboard, or pop a balloon, as loud as possible. I used a 30 second sweep, since that produces the most accurate IRs. Cut the recording after the clap, or both the sweep and tail tones have completed. Invoke Altiverb. 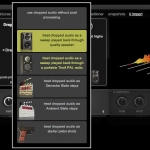 Open the Altiverb plug-in in Pro Tools, or Soundminer. Copy the recording. 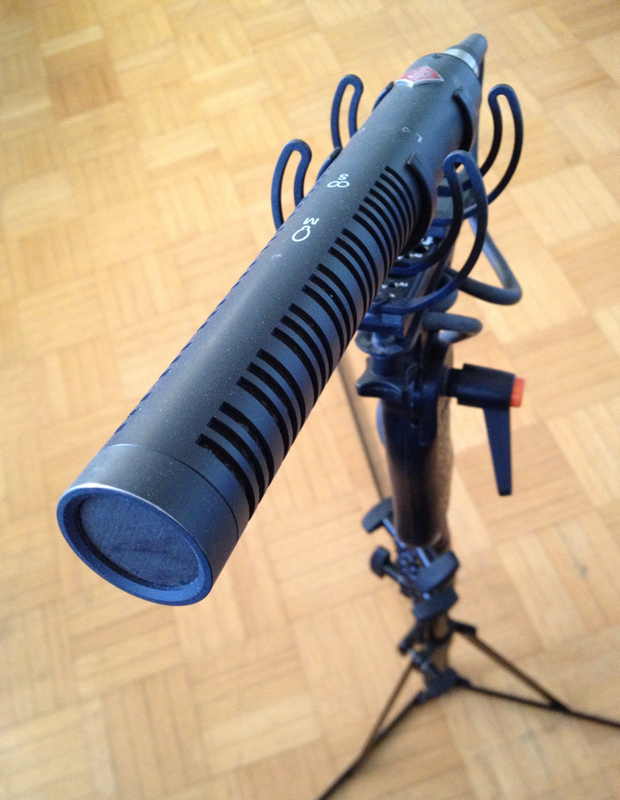 Drag your recording of the clap or sweep onto the Altiverb 7 window. The plug-in will work away and create the IR. Save the IR. Click the “Save to user IR folder” to commit the IR to your IR library. Did your recording create a decent, representative impulse response? The only way to be sure it to test your IR upon the original source song, and compare it with the one recorded on location. Import the location recording. Add the reference track version of the song you recorded on location (step 5, above) to a Pro Tools session. Import the original song. Also add the source track without any processing. Process the original song. Use Altiverb 7 to apply your new IR to the original song. Compare the recordings. Does your newly processed track match the one recorded on location? If so, you have captured an accurate impulse response. Naturally, one would wonder how much equipment quality affects IR fidelity. I knew that the Neumann and 722 would produce good results. But what about the Braven? To learn more about the impact of equipment on IRs, I reached out to the Altiverb crew themselves. Aram Verwoest from Audio Ease support graciously answered my questions. When you playback audio through your IR it will sound like you playback this file through the speaker you used and recorded with the mics you used. When the speaker sounds more like a speaker (i.e., if it colors the sound or if it bundles much into one direction) instead of a natural sound source, then you will hear this in the IR. Same goes for the mics. We like omni directional microphones for recording acoustics, as these give a natural (broad) panorama when compared with cardioid mics, and a wider stereo image. Our go-to set (because of its transparency) is a Genelec speaker (model 1031, 1032 or 1037) and DPA 4006 omni directional microphones. If you like recordings you make with the D50, then the IR will turn out the same way. If you would use omni mics instead of the D50 cardioid mics you will get an IR that is wider/more stereo. So, how did my minimalist gear choices perform? Is the mobility provided by sidestepping cumbersome gear worth the results? Well, playing tracks from the iPhone was fantastic. The Braven itself was somewhat underwhelming, for pro purposes, anyway. But did it produce IRs well? Were they satisfying? I’ll let you judge. I’ve created a free Impulse Response library page in the menu bar, under “Projects”. Download free Altiverb 7-compatible IRs there, test them yourself, and feel free to use them however you wish. One way to test these IRs is to apply them to other recordings. Here are the IRs I captured, applied to the same dialogue I used in the last article. The original is followed by 4 IRs I recorded with my minimalist gear. Notice how the broader, 11th floor 3-meter IR compares to the 1-meter version. You’ll notice that the 23rd floor IR is brighter, possibly due to all the metal in the area. It’s also larger than the 11th-floor versions because of the higher ceiling. The wooden sauna IR predictably sounds flat and tight. So, what can we draw from this? Would cartloads of expensive gear help? Of course. IRs will naturally improve with better gear. That’s not the entire story, however. Would I have captured the same IRs if I needed a self-powered monitor, power, and cabling? Definitely not. It’s far too involved to do on every shoot. Perhaps I’d record IRs if I dedicated myself to the task. However, since I want to record IRs routinely while field recording, complicated equipment won’t work. Using this minimalist set-up added no more weight than a paperback and barely more space than a soda can. The small size and portability allowed me to capture IRs in less than five minutes per location. Overall, however, I think the benefits of portability and accessibility outweigh drawbacks of the elaborate recording process that’s typically needed for IR recording. I was satisfied with the results. The IRs conveyed differences in location well. 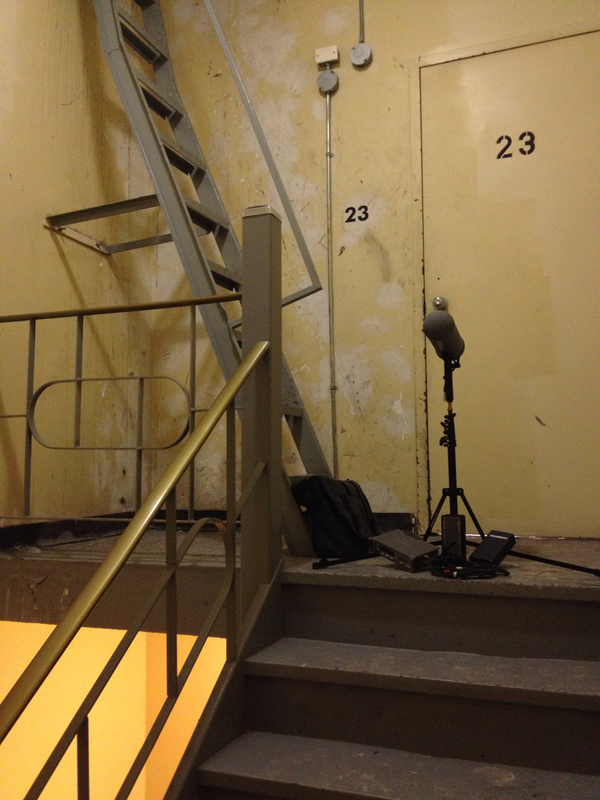 I was especially impressed by the subtle difference between the 1- and 3-meter stairwell recordings. The sauna IR was quite close to the sound there in real life. I do suspect, though, that outdoor IR recordings would be more challenging. What if you prefer to improve your gear, and you don’t care about a minimalist set up? If you have options and time, go for it! 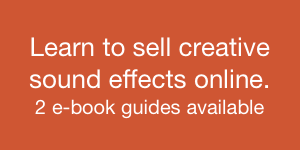 However, don’t be discouraged if you can’t afford $4k worth of gear, or the time and effort to set it up. It’s possible to produce decent results from a minimalist kit while complimenting your existing field recording workflow. 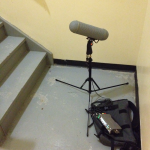 When you minimize your equipment, choose high-quality gear, and streamline your workflow, you’ll find you will gather another tool during your field recording sessions: an evocative impulse response library. 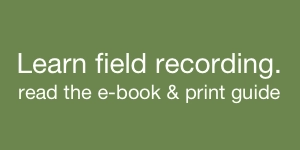 Visit the free impulse response library.